I am a mum of two and Primary School teacher whose aim is to never be home during the midday movie. I believe that I am only ever a car trip away from an adventure. 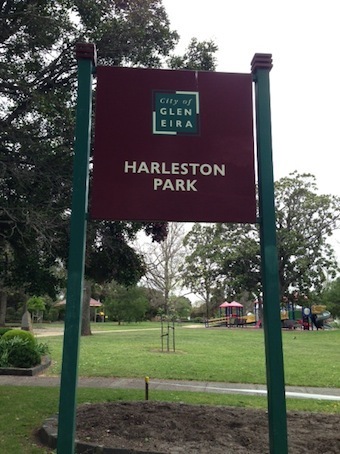 Located between two lovely, leafy suburban streets in Elsternwick is Harleston Park, named after a town in Norfolk, East England. This pretty space is a hit with the local community and well worth a visit if you're heading out that way. 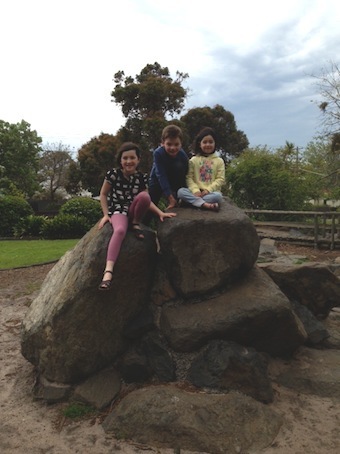 It's a beautiful, well established and landscaped park, obviously well maintained and cared for by the Glen Eira Council and it boasts many fun things for kids and families to do. We prefer to call it The High Hill Park. In our personal opinion, however, Harlestone Park should be renamed. We believe The High Hill Park is a much more fitting title and in fact that's how it's referred to within our circle of friends. This is because the main draw card to this great little spot is the long, wavy slide that sits high upon a hill and sends kids of all ages careening down the mountainside. If you are feeling the need for speed slide down on a sweater. Thankfully it's not a fast slide when compared to others, particularly of this slope, which makes it most appealing to the more conservative thrill seeker. Yet those after an adrenalin rush can be seen sitting on their sweaters or lying on their backs and on their sweaters and gaining a great deal of speed this way. Normally they come to a relatively gentle finish at the bottom of the slide but it's not unusual to see kids skimming across the dirt. Of course the downside of a long slide is the steep climb up but little legs will not be put off and there are built-in steps along the rubber rock edge to help out parents who are chasing after their thrill seekers. And of course who can resist rolling down a hill like that? Thankfully there are green grassy sides you can do that safely on. 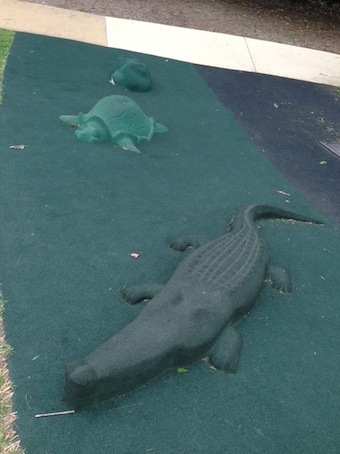 These creatures watch over the slide and help you climb up the hill. 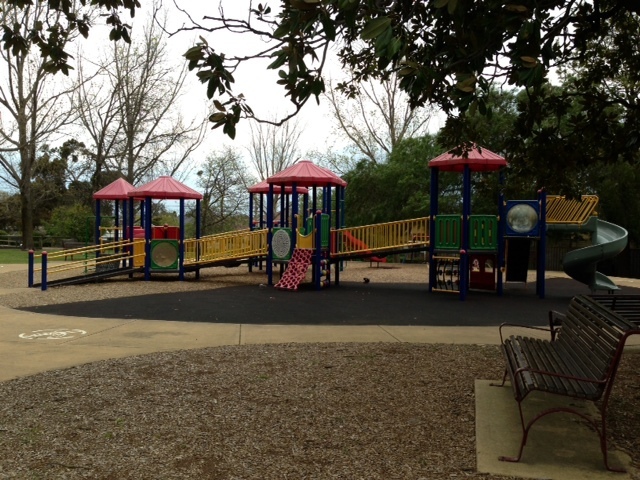 But apart from the steep slide, Harleston Park has much more to offer kids and families looking for some outside time. It suits toddlers right through to primary-aged kids but there is a ban however on ball games and bike riding too; unusual for a park environment but perhaps it's all in aid of protecting the flora. This may impact on the enjoyment factor of older kids. There's also a large and colourful playground with tunnels, ramps, a climbing mat, a mini rock wall to scale, bridges, a selection of slides of a lesser height than the one that adorns the hill, and a big, interactive bead frame and Tic-tac-toe board. There are also two swing sets, one with toddler seats and the other well and truly far enough from the rest of the equipment to encourage swinging to dizzy heights. Kids will enjoy the monkey bars (and the blisters they receive as badges of bravery), the flying fox and the see saw. 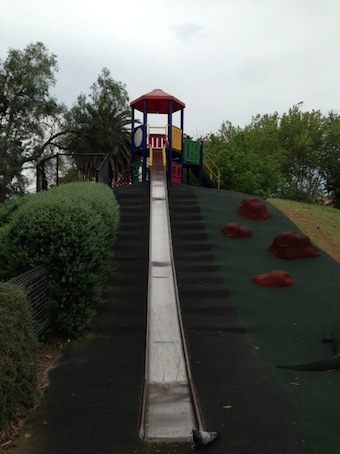 Walk, climb, slide and run your way around. 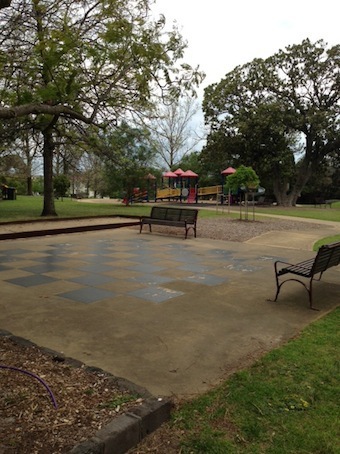 The park has some beautiful scenic spots to play in as well. There is an old timber bridge which my girls are convinced has a troll living beneath, an empty lake and a rock formation to clamber all over. This rock feature is very popular with kids but can be tricky to navigate so it's a good idea for an adult to hover if younger kids are climbing on or around it. The rock feature is a big hit with mountain climbers. There are numerous spots to sit and relax at or to share something to eat. Of course, the luscious green lawns are a welcoming spot for a blanket or else there are tables and chairs, including two in a rotunda with a couple of electric barbeques. 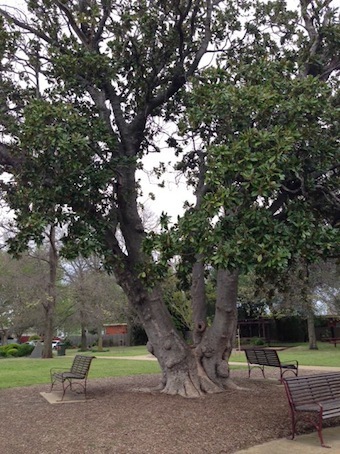 You can even claim a bench under the shade of a big old tree. The rotunda can be booked for parties and larger group picnics. 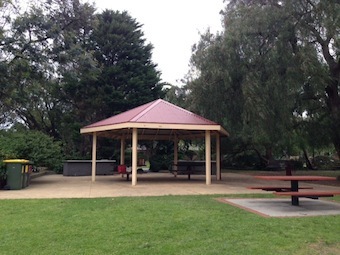 If you are planning a party in the rotunda or a bigger group for a picnic you need to contact the Glen Eira council park booking officer to book in advance on (03) 9524 3253. This entitles you to use the space exclusively and is clearly marked for other park visitors to see via a standing notice holder. This means you don't have to send someone hours before the event to secure the spot. A big old tree offers shade on a sunny day. If, however, you prefer to be slightly further away from all the excitement then there's a long covered walkway where you can sit and watch the abundance of pigeons and families enjoying the park. Chess and Bocci are allowed. A toilet block is available on site and there's ample street parking on both sides of the park, Allison Road and Seymour Road. This is a lovely park with gorgeous trees creating shade and encouraging bird life to the area. Look out for the giant chessboard (no pieces however) and a bocci space too, but again you will need to bring your own equipment. Oh, and don't forget your sweater! It's a shame that you can't hire chess pieces to play. It's a bit pointless having a board, as it stands right now.